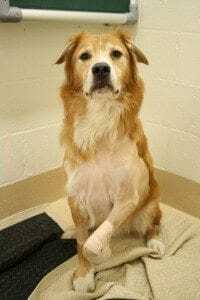 Cayenne #5066 - Yankee Golden Retriever Rescue, Inc.
YGRR received a call from an emergency animal hospital in New England. A 4-year-old dog named Cayenne had been brought in after being struck by a car. Cayenne’s owners only had him for a week and were playing with him off-leash when he ran into the road. His new family could not afford the surgery that would be necessary to repair his leg, and the only alternative would be to euthanize him. YGRR received a call from the animal hospital, and since Cayenne needed surgery right away, we took ownership of him and paid for his surgery immediately. The surgeon was unsure if Cayenne’s leg could even be saved, but we asked him to try. Luckily, the surgery was a success and Cayenne came through it with 4 legs. We went to pick him up a day later and brought him back to Riverview to begin his rehabilitation. Cayenne’s fracture was in the worst possible place and he ultimately required more than one operation. While he recuperated at Riverview, we got to know Cayenne as a very affectionate and playful boy. He was more reserved with strangers than most Goldens, however. This, combined with his white stripe, white feet, and white tail tip made us think he had some herding dog mixed in with the Golden. He was a wonderful boy who carried toys around in true Golden fashion and was well-behaved. 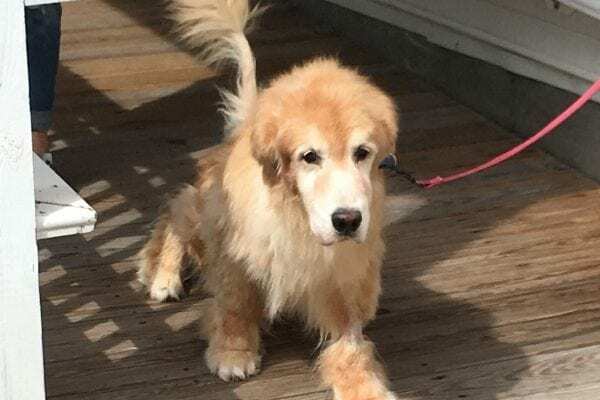 We knew he needed a special home, one that was open to the option of an “almost Golden.” A special family of repeat adopters (whose wonderful YGRR Golden, Buddy, had recently passed away at the age of 16!) was looking for another lucky dog to share their hearts and home. When they learned Cayenne’s story, they said of course they were open to meeting him! As soon as he came into the room, they fell in love with him. Cayenne, sometimes more aloof with strangers, instantly loved them, as well! It was obvious this special guy had found his forever home. Cayenne’s adopters believe he is part Border Collie, both based on his appearance and because he is very smart! Cayenne has fit in beautifully. He loves his adopters, and he gets along very well with his kitty siblings, as well. Outside in his safely fenced yard, he delights in his ability to chase the squirrels. Although he is usually a gentleman in the house, Cayenne apparently quite enjoys baked goods. His adopters have learned that it is unwise to leave anything sweet on the counter – even if it is wrapped! They love their boy, and Cayenne has found a home where he will be safe and loved as every dog should be. Cayenne thanks you for your support. We accepted Cayenne into our program knowing that we had the resources to save his life, thanks to the generosity of our supporters. We are grateful that we were here when he needed us. You made it possible to save Cayenne. Together, we can make a difference for all homeless dogs. We thank you, and Cayenne and the Rescue dogs send big wags and kisses your way!